What a privilege to be invited to the 10th anniversary celebrations of This Is Knit in Dublin! And also to be joined by one of my favourite travelling companions the fabulous Louisa Harding and her daughter Belle. Nell was going to come with us too (we had privately named it the Designer and Daughters Squad), but unfortunately, she broke her foot just before the trip. Hopefully she will be back in high heels before her wedding in 6 weeks time! 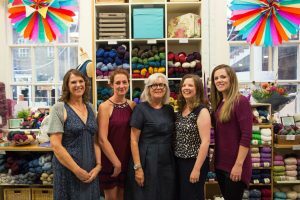 This is Knit is a family business run by my old friends Jacqui, Jenny and Lisa. Always a delight to meet up with them again and to be in their wonderful shop nestling in the Georgian splendour of Powerscourt. Jacqui, Louisa Harding, Debbie Bliss, Lisa and Jenny at the This Is Knit 10th Anniversary celebrations. 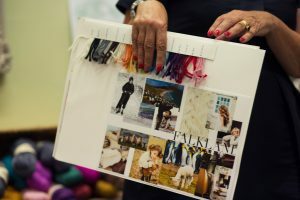 The trip gave me the opportunity to talk about my two Pure Bliss yarns, Lhasa and Falkland Aran and the inspiration behind the collections. Falkland Aran moodboard. The inspiration behind the collection. 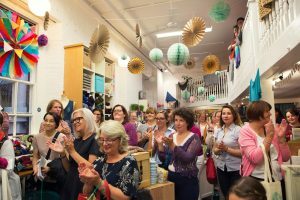 The shop was packed with customers not only eager to try out the new yarns from Louisa and myself but also to support this well loved store. Congratulations This Is knit! Here’s to another successful 10 years!